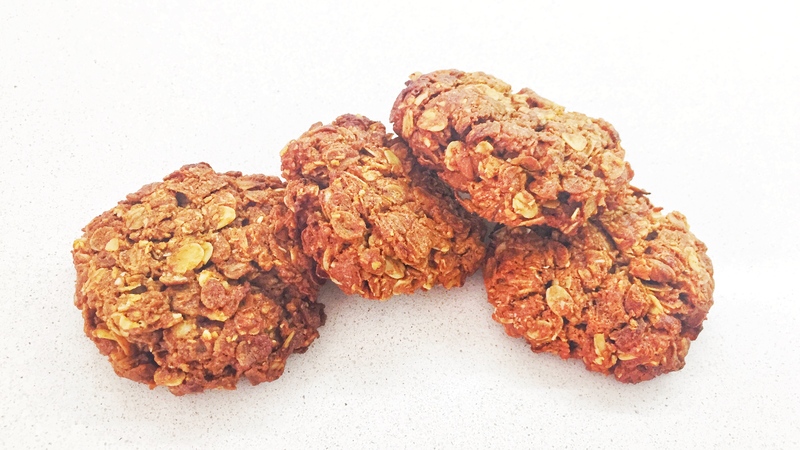 Anzac biscuits were made by wives and women’s groups and sent to Australian and New Zealand soldiers during war as they did not spoil and could be easily transported. Today, they are made in remembrance of the sacrifice soldiers made for Australia and New Zealand and traditionally baked on Anzac Day. Here is my take on the Anzac biscuit. It is packed with fibre with the goodness of oats and coconut and has a soft chewy texture. Heat oven to 160 C and lightly grease cookie tray. Add oats, flour, coconut, cinnamon and sugar to bowl and mix to combine. Add olive oil, golden syrup and 1/4 cup water to a small saucepan and stir to combine over a medium heat. Add bi carb soda and stir while foaming. Add wet ingredients to dry mixture and stir to combine. Using slightly wet hands form into 12 balls and place on baking tray. Using a fork lightly flatten and bake for 10 mins. Note: Biscuits will harden as they cool. Bake for 5 mins longer for a harder biscuit.